It is located 15 Km northwest of Julfa (Northwest of Iran) in a deep canyon along the Aras River on the Iranian side of the border between Azerbaijan and Iran. This site protects the rich culture of Armenian Christians. It was built in the 9th century and was rebuilt in the Safavid era after several earthquakes damaged it. Bam is the world's largest mud brick building near the city of Bam in Kerman province in southeastern Iran and its Cultural Landscape is an outstanding example of a Central Asian trading settlement. The town had its heyday from the 7th to 11th centuries. The ancient citadel of Arg-e Bam probably has a history dating back around 2000 years ago but most buildings were built during the Safavid dynasty Bam was almost completely destroyed in an earthquake on December 26 2003. It is located along a historical trade route in the Kermanshah Province of Iran. Its primary monument is the Bisotun Inscription made in 521 BC by Darius I the Great when he conquered the Persian throne. The inscription is written in 3 languages: Elamite Babylonian and Old Persian. It is to cuneiform script what the Rosetta Stone is to Egyptian hieroglyphs: the document most crucial in the decipherment of a previously lost script. A British army officer Sir Henry Rawlinson had the inscription transcribed in two parts in 1835 and 1843. Meymand is a very ancient village which is located near Shahr-e Babak city in Kerman Province Iran.The Cultural Landscape of Maymand covers a dry desert valley in Central Iran which is home to semi-nomadic people. They practice a three phase transhumance system. In winter they live in troglodytic houses carved out of soft stone rocks. The designated area contains houses animal shelters water collection points agro-pastoral systems and rock-art. Golestan Palace Tehran relic of a historic palace residence of the kings of the Qajar dynasty and the most beautiful and oldest buildings in the capital of the bicentenary of the counts. The palace buildings were built at different times. 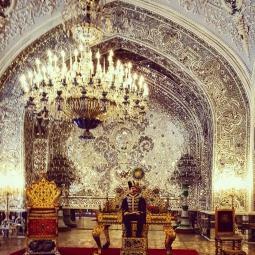 Its name is derived from the Hall of Golestan in building output.The site comprises 8 palace complexes around a garden. Notable features include: Marble Throne (Takht-e marmar)Hoze Khaneh a summer chamber with cooling systemTalar-e Aineh (Hall of Mirrors)Shams-ol-Emareh (Edifice of the Sun) Several museums. Gonbad-e Qabus is a monumental tomb tower and is located in Gonbad-e Qabus city Golestan province in north of iran. The architectural style is a secret way and the building is one of the world's tallest brick tower all over the world . The 53 metres high tower was constructed using unglazed fired bricks. Its form is cylindrical with a conical roof and standing on a stellar plan. It became the prototype for the construction of tomb towers in the history of Islamic Architecture. The tower is the only part that remains of the historic town of Jorjan. It stands on a domed hill in a park in the center of the current city Gonbad-e Qabus. Masjed-e Jame of Isfahan represents a condensed history of Iranian Architecture. It displays architectural styles of different periods in the country's Islamic architecture. The mosque was built in the four-iwan architectural style placing four gates face to face. It later became a prototype for mosque and dome design. Located in the historic centre of Isfahan it is the oldest Friday mosque in Iran. It was developed from the 9th century onwards. Meidan Imam Isfahan is one of the largest city squares in the world and Built by Shah Abbas I the Great at the beginning of the 17th century .The square is surrounded by important historical buildings from the Safavid era. The Shah Mosque is situated on the south side of this square. On the west side you can find Ali Qapu Palace. Sheikh Lotf Allah Mosque is situated on the eastern side of this square and the northern side opens into the Isfahan Grand Bazaar. They are an impressive testimony to the level of social and cultural life in Persia during the Safavid era. Pasargadae was the first dynastic capital of the Achaemenid Empire founded by Cyrus II the Great in Pars homeland of the Persians in the 6th century BC. Its palaces gardens and the mausoleum of Cyrus are outstanding examples of the first phase of royal Achaemenid art and architecture and exceptional testimonies of Persian civilization. Persepolis was an ancient ceremonial capital of the second Iranian dynasty the Achaemenid Empire. Archaeological evidence suggests that the earliest remains of Persepolis date from around 518 BC. It was Darius the Great who built the terrace and the great palaces. The surviving ruins of Persepolis today are a mere shadow of Persepolis' former glory. The importance and quality of the monumental ruins make it a unique archaeological site. The settlement appeared around 3200 BC. The city had four stages of civilization and was burnt down three times before being abandoned in 2100 BC. The site was discovered and investigated by Aurel Stein in the early 1900s. The Sheikh Safi al Din Khanegah and Shrine Ensemble in Ardabil is a Sufi spiritual retreat dating from between the early 16th century and late 18th century. The complex is a fine example of medieval Iranian architecture. The site includes a library a mosque a school a mausoleum a cistern a hospital kitchens a bakery and some offices. The floor of the shrine is covered with a reproduction of the most famous carpet in the world the Ardebil Carpet. Shushtar Historical Hydraulic System is an island city from the Sassanian era with a complex irrigation system. The river was channelled to form a moat around the city while bridges and main gates into Shushtar were built to the east west and south. A system of subterranean channels called Qanats which connected the river to the private reservoirs of houses and buildings supplied water for domestic use and irrigation as well as to store and supply water during times of war when the main gates were closed. Traces of these Qanats can still be found in the crypts of some houses. This complex system of irrigation degenerated during the 19th century. The ancient city of Soltaniyeh was the capital of the Ilkhanid dynasty (13th and 14th centuries) which was founded by the Mongols. The main feature of Soltaniyeh's several ruins is the Mausoleum of Il-khan Oljeitu traditionally known as the Dome of Soltaniyeh. It is a key monument in the history of Islamic architecture. The structure erected from 1302 until 1312 boasts the oldest double-shell dome in the world. The octagonal building is crowned with a 50m-tall dome covered in turquoise blue faience and surrounded by eight slender minarets. Susa was an ancient city of the Elamite and Achaemenid empires. It is one of the oldest-known settlements of the region dating from as early as 4395 BCE The archeological site is located in the lower Zagros Mountains. It comprises two components: Susa archaeological complex and the area of Ardeshir's Palace. The Tabriz Historic Bazaar Complex is one of the oldest bazaars of the Middle East and the largest covered bazar in the world. Tabriz has been a place of cultural exchange since antiquity and its historic bazaar complex is one of the most important commercial centres on the Silk Road. Takht-e Soleyman "The Throne of Solomon" is the holiest shrine of Zoroastrianism and the former Sassanid Empire. The archaeological site of Takht-e Soleyman in north-western Iran is situated in a valley set in a volcanic mountain region. "The Persian Garden" comprises nine gardens from different epochs and climates. They derive from the Chahar Bagh model: the division of a site into 4 sectors opening out into the 4 cardinal directions. This dates back to the 6th Century BC The tradition and style in the garden design of Persian gardens has influenced the design of gardens from Andalusia to India and beyond. The design is dominated by geometry and the use of water as a central element. The 9 designated gardens are: Royal Garden of Pasargadae Bagh e Eram in Shiraz Bagh e Chehel Sotun Bagh e FinBagh e Dolat Abad in Yazd Bagh e Pahlavanpur Bagh e Shahzadeh Bagh e Abas Abad Bagh e Akbariyeh. Dasht-e Lut was inscribed to the UNESCO world Heritage Sites list on July 17, 2016. Dasht-e Lut, a large salt desert in Iran, is the world's 25th largest desert. The surface of the sand there has been measured at temperatures as high as 70 0C (159 0F), and it is one of the world's driest and hottest places. One of the most beautiful phenomena in Lut desert is Kaluts. These tall strange cliffs that are shaped by centuries of water and soil erosion create spectacular scenery in desert giving a real scene of isolation. Dahte Lut is spread in 52000 square Kilometer in east and south east of Iran.